Slow cooker honey mustard chicken takes just 5 minutes to prep and can be used in so many ways! I watered my garden yesterday. This made me feel very accomplished. And also a bit guilty. It had probably been about two weeks. I keep forgetting about it! We moved to a new house this year and my garden has been relegated to a small plot that’s up against the house in the backyard. Can’t see it unless I’m ALL the way out in the backyard. And that’s usually when we’re playing in the afternoon and it’s not a good time to water. So I keep forgetting to do it. I also don’t weed. Ever. Yeah, I’m pretty much the laziest and worst gardener ever. How are my plants doing, you ask? Well, the basil and rosemary are troopers and look beautiful. The parsley wilts and looks dead but then perks up as soon as I give it some water. Sorry, parsley. The peppers are actually OK – I’m about to have a haul of jalapenos. The tomatoes, however, have yielded nada. I don’t know if it’s my current neglect or if it’s because we waited way too long to stake them and ended up shoving all the branches into the cage, breaking some along the way. I know, shame on me. As for this recipe, can we put honey mustard on all.the.foods and call it a day? OK, good. Because if I don’t have time to water my garden, I don’t have a ton of time for cooking either some days. Slow cooker to the rescue! I don’t know about you, but I think slow cooker meals can be disappointing sometimes. Plenty of things just don’t hold up well in a slow cooker and sometimes it all just seems dull. I’ve found and created a few gems over the years and am always on the lookout for new ones that might be keepers. Because you can’t beat the convenience of a slow cooker meal. 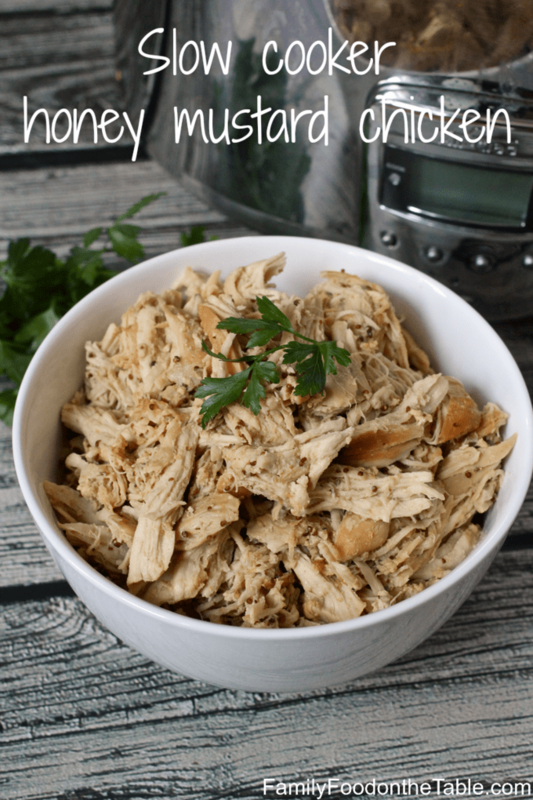 This honey mustard chicken is one of those super easy, throw it in and forget it type of slow cooker recipes (my personal favorite). No pre-cooking or browning or even chopping needed here. And this honey mustard chicken is so versatile. Here’s a few of our favorite ways to serve it. 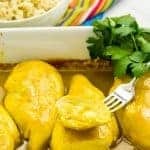 I will serve the chicken with some of the extra sauce over brown rice, couscous or even polenta – pair it with a side salad or steamed or roasted broccoli. I even like it over a fast baked potato. I like pretty much anything over a potato. Or sometimes we make honey mustard shredded chicken sandwiches: just pile the chicken on a burger bun and add your favorite fixings – mayo, some lettuce and tomato, even some bacon or avocado slices. Or put the shredded chicken in a whole wheat wrap with some broccoli slaw and roll it up for a delicious, light lunch. Add this to your regular rotation and you’ll be happy you let your slow cooker make you dinner. Enjoy! 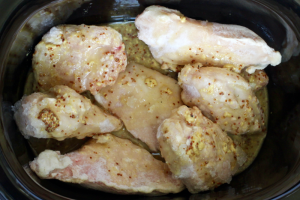 Season chicken breasts with salt and pepper and add to crock pot. Whisk remaining ingredients together in a small bowl until well combined. Pour over the chicken in the crock pot. Cook on high for 3-4 hours (or low for 6-8 hours). If possible, stir it around somewhere halfway through the cooking time. Don’t worry if you’re not there to do this part. Once it’s cooked, remove the chicken breasts and shred with two forks (or in a stand mixer if you have one). 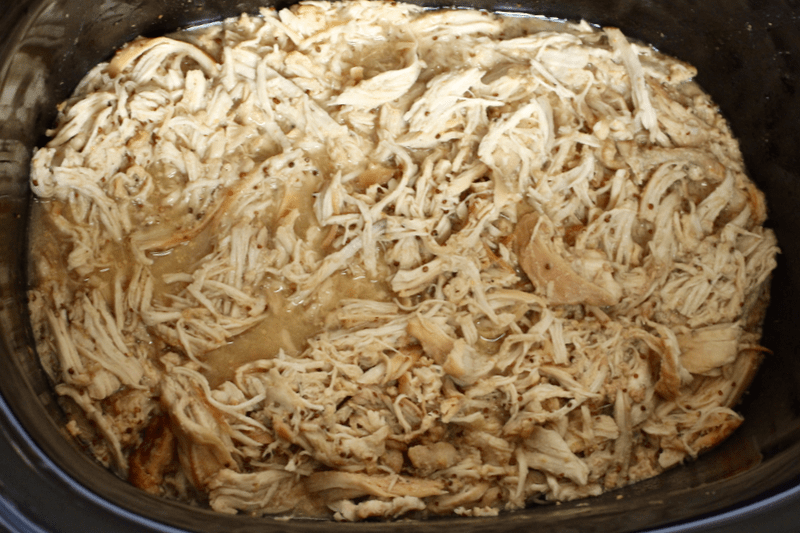 Return the shredded chicken to the slow cooker and stir with the sauce. If you like it extra mustardy, like me, add the extra tablespoon each of Dijon mustard and whole grain mustard. Gives it a nice punch of flavor! 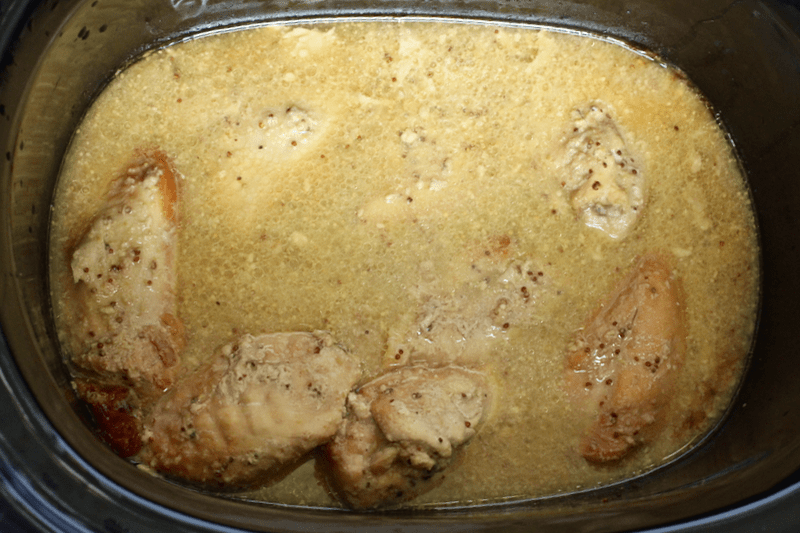 Let the chicken sit in the slow cooker on warm for 10-15 minutes to help soak up the juices. Serve and enjoy! You can easily double this recipe so you have one batch to eat now and one batch to freeze and eat later. 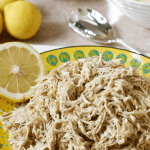 If freezing, freeze the cooked shredded chicken with some of the sauce so it will stay moist when you defrost it and heat it up. 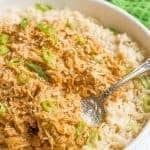 I love cooking in the slow cooker and this looks all kinds of delicious. Cooking a batch now and a batch of later is always a good idea and the possibilities for serving are almost endless! Love it! Thanks, Sammie! I always like to have a little extra stashed away, just in case. 🙂 Cause I can always find a way to use it! I love this… For mom on the go a fast wrap is a life saver! So with you on that Nisreen! A one-handed portable food is always a good idea 🙂 Thanks for stopping by! 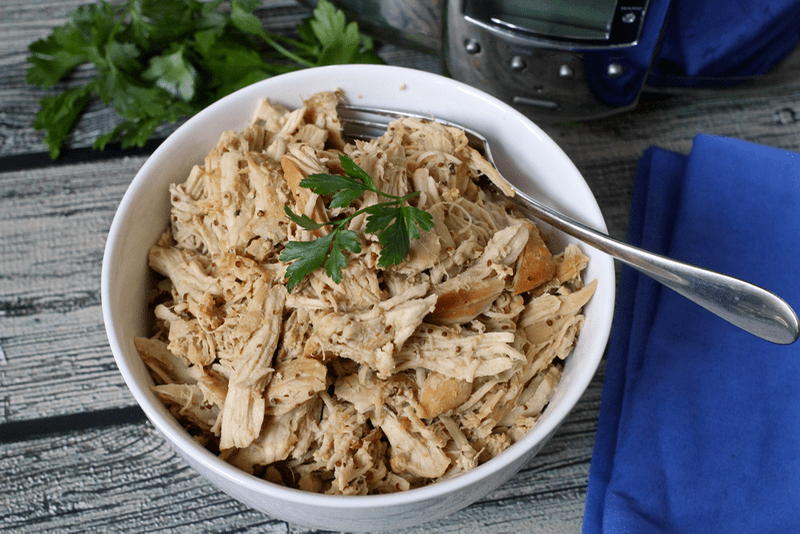 We love chicken at our house and anything you can do in the slow cooker is just a winner! This looks and sounds great! Thanks so much, Chris! 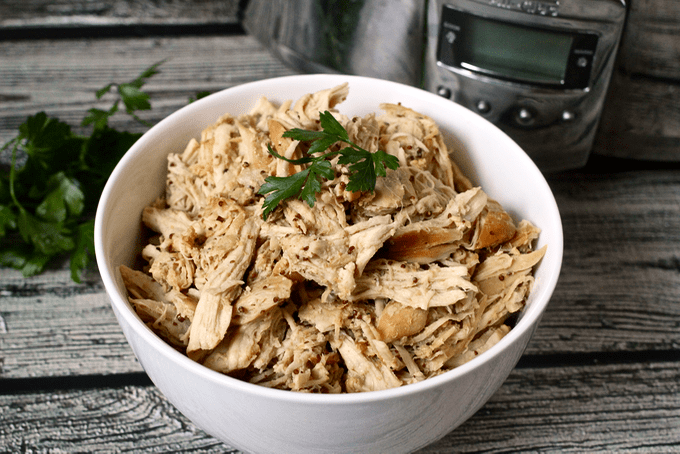 We are big chicken eaters, too, and yes – the slow cooker is such a help! It’s times like these when I wish I owned a slow cooker. 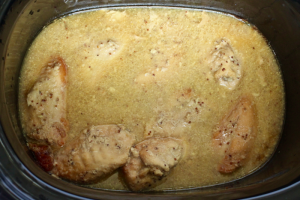 Honey-mustard chicken is one of my faves!! So perfect if you need to make a big batch of chicken wraps/sandwiches etc. Thanks Claire! Yes, it’s great for making a batch of sandwiches and wraps for the week to have on hand. Hope you give it a try! Sounds like an amazing recipe! Now, I just have to get a crock pot! Haha, thanks Lynne! Hope this encourages you to buy – it’s such a huge help on busy weeks to be able to prep part or all of your dinner in the crock pot! I don’t use my slow cooker as often as I should. This looks great! Oh I love this… because I am also in love with my slow cooker. I use it summer, winter, spring… it doesnt get dusty in my cupboards and this recipe looks sensational. Can’t wait to give it a try. Versitlity plus! 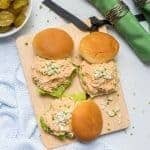 From FFF link-up, also if your interested, every Sunday we host a Meal link up party called Your Weekly Feed sharing meal inspiration for the week ahead. Love it if you’d pop by maybe link-up a scrumptious recipe or too. Thanks, Kim! 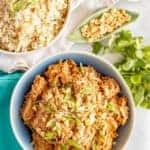 I love a recipe that can do double or triple duty and last throughout the week 🙂 I will definitely check out the link-up – thanks and have a great weekend! Ooh I love Honey and Mustard and agree it should be put on EVERYTHING! This looks so easy and delicious, I’ve pinned it to try out soon. Thanks so much for linking up with us for Fabulous Foodie Fridays! Let’s do it, Lauren – a week of all honey mustard! Well, OK, maybe not ALL… but I’m glad you’re with me 😉 Thanks for hosting such a delicious party! Hope you give this a try – I love having it on hand to use in so many ways! Thanks Quinn! 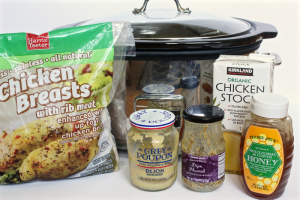 Crock pots make for such easy dinners, don’t they? Thanks for hosting such a yummy party! I just made a recipe with Honey Dijon soup with kale and purple potatoes! What a great idea to slow cook honey dijon into chicken. And I love all the ideas of how to eat it!! I already said that I was going to cook in the crock pot more this fall. I am going to try this recipe!! I’m a total honey mustard addict – have been since I was little 🙂 Hope you try this and let me know what you think! Hi Kathryn, just wanted to tell you how much I enjoy your site & recipes. Hope you don`t mind but I used your Salmon, Potatoes and Asparagus Sheet Pan Dinner in a blog post today. 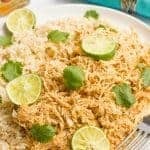 Obviously linking to your original post & giving you credit) You can see it at http://www.chileandsalt.com/16-seafood-recipes-you-need-now/ if you`re interested. Thanks for all the great posts. Thanks so much Tez! Don’t mind at all – thanks for featuring me! I’ll be sure to share the post!